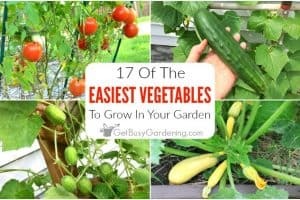 Overwhelmed with some of your harvest from the garden? 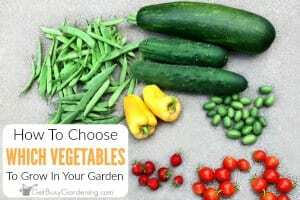 Want to try your hand at canning garden vegetables this year? 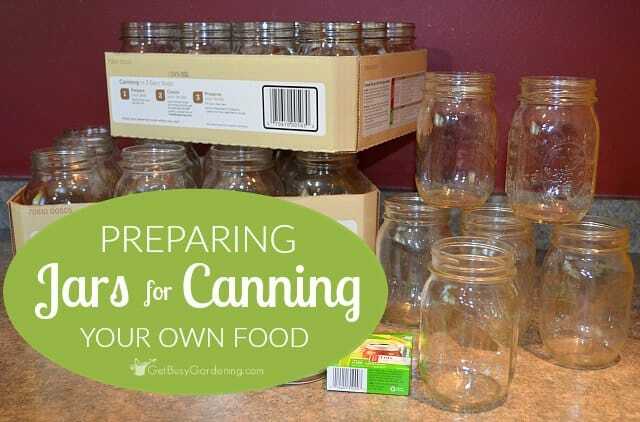 Canning can be super intimidating if you’ve never tried it before, but it’s really not that hard. One of the scariest things about canning (at least it was for me) is preparing jars for canning, and making sure that everything is properly heated and sterilized. 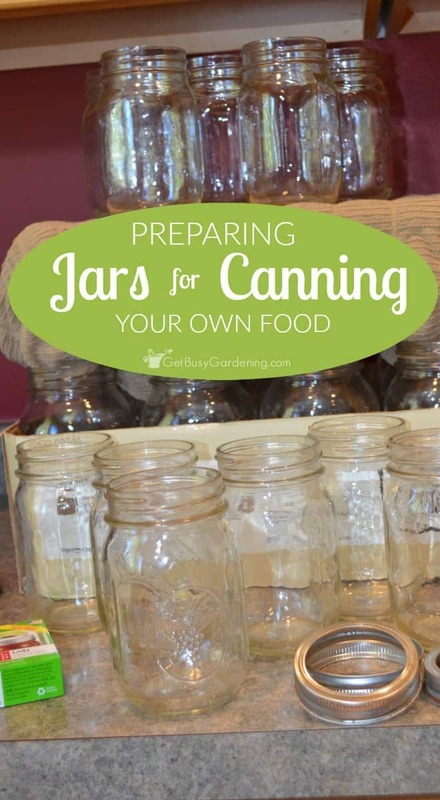 There are a few ways you can prepare your jars for canning. I prefer to heat my glass canning jars in boiling water. You could also use the oven or the dishwasher, but I’ve never tried either of those methods before. 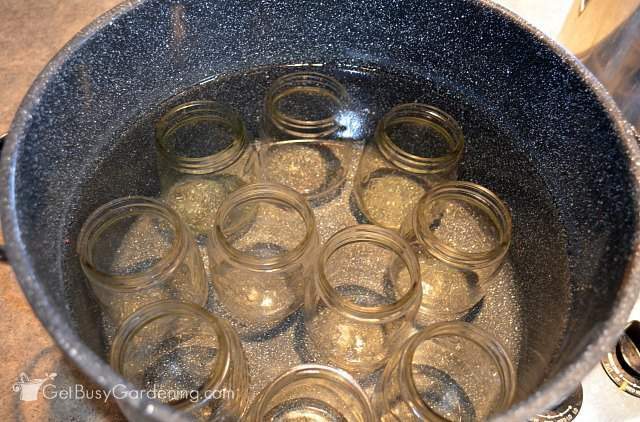 Here are the steps I take when I’m preparing jars for canning using the boiling water method. 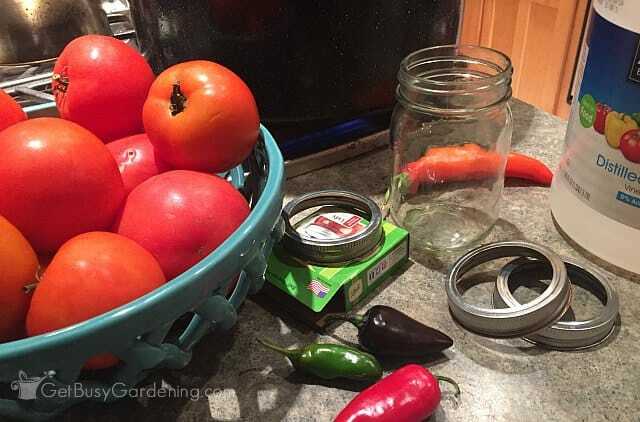 It’s awesome that you can reuse your glass canning jars over and over again… but if you’re just starting out it’s best to buy brand new canning jars rather than using super old ones. Many types of old canning jars no longer meet modern canning standards. 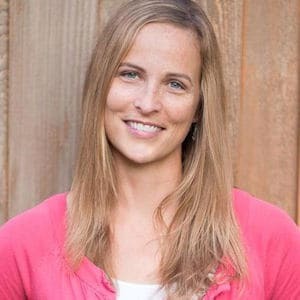 It’s not that expensive to buy canning jars, and it’s totally not worth the risk of broken jars or spoiled food just to save yourself a few dollars. 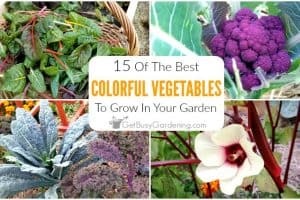 , blue canning jars or any other fancy canning jars in a rainbow of colors… the steps to prepare your jars for canning are the same. Step 1: It takes a while for a large pot of water to boil, so the first thing I do is fill my water bath canner with water and turn it on high so it can start to heat up as I’m working. 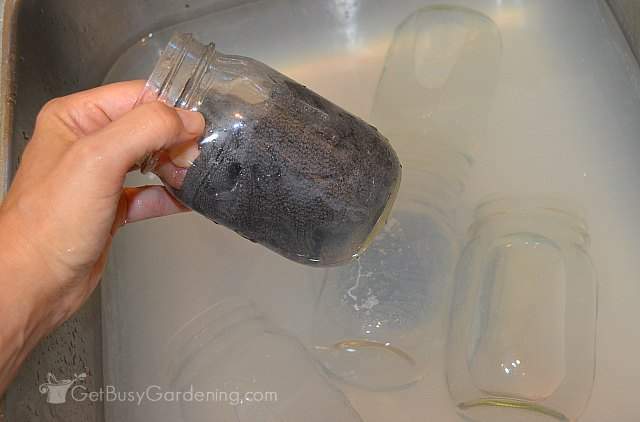 I always add about 1/4 – 1/2 a cup of white vinegar to the water to prevent a white film from building up on the jars. After reusing your jars a few times, you might notice a white film starts to build up on them over time. This is totally normal and nothing to worry about. 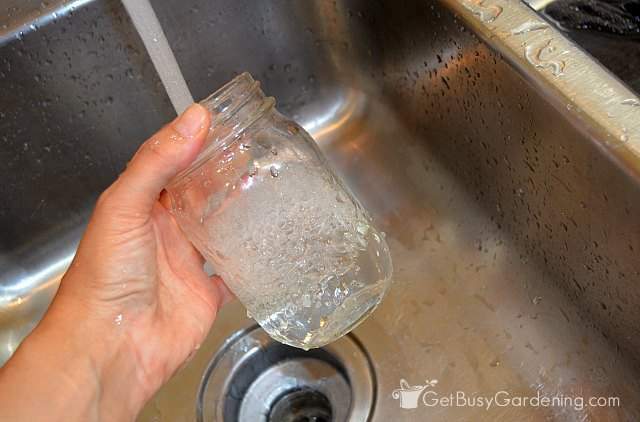 Adding white vinegar to the water in the canner prevents this buildup, and helps keep your jars looking their best. 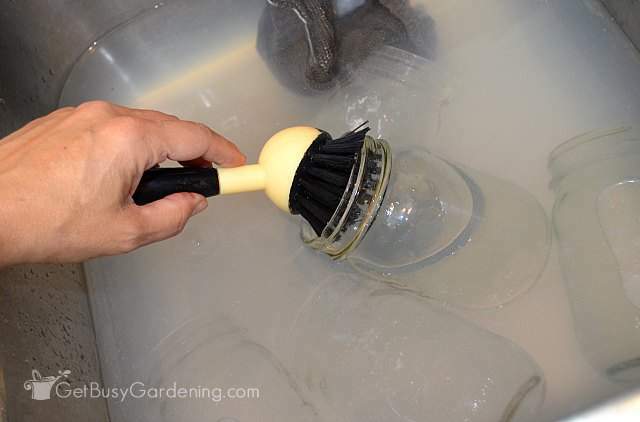 Step 2: Fill the sink with hot, soapy water (you’ll use this to wash your jars). If you have enough time, you can wash them in the dishwasher instead of washing them by hand. Step 3: One of the most important steps in preparing jars for canning is to check each one of the jars and discard any that have nicks, cracks or an uneven rim (you can toss them into the recycling bin, or set them aside to use for dry storage or craft projects). Even if your jars are brand new, don’t skip this step. I inspect my jars as I’m adding them to my dishwater. Step 4: Wash both previously used and brand new jars in hot, soapy water. Since I store my empty jars on a shelf in my basement (where they can get dusty), I like to use a plastic dish brush to clean my jars. Never use a brush with abrasive bristles like wire or steel wool. These could damage your jars and weaken them. Of course you can always use a clean dishcloth instead. You don’t have to be too fussy about cleaning your jars if they aren’t super dirty. Just give them a quick wash. Step 5: Rinse jars thoroughly with hot water, taking care to get all the soap off. If you’re going to be putting your jars into hot water, then it’s crucial that you rinse your jars in hot water and put them into the canner right away. Never allow glass canning jars to cool before you put them into hot water or they could break. I like to fill my jars with hot water before adding them to the canner. This way, I don’t have to fill the pot so full in step 1, and carry that heavy thing to the stovetop. Step 6: Gently add the jars to the water in the canner. Don’t just drop the jars into the water, or let the jars bang against each other. That can cause the jars to crack or chip (plus if you plop a glass canning jar into the water, it will splash hot water everywhere). Make sure to turn empty jars sideways as you slowly lower them into the water, or the hot water could splash up and burn you (ehem, not that I would know anything about that). A canning jar lifter is an essential tool for moving jars in and out of hot water, if you ask me. Step 7: Once all the jars have been cleaned and put into the hot water canner, add more water to cover the jars completely (if necessary). Step 8: Bring the water to a boil to heat the jars, then allow them to simmer for 10-15 minutes before filling them. Don’t remove the jars from the simmering hot water until you are ready to fill them. That’s it! Now your jars are ready to use for canning. See, I told you it was easy. Preparing jars for canning is an important first step in the food canning process, and one you definitely can’t skip. But, like I said before, it’s not that hard so don’t be intimidated. Once you do it a few times, it’ll become second nature. 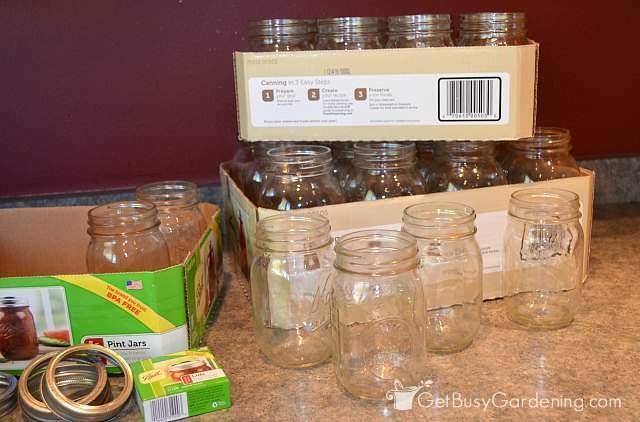 What steps do you take when preparing jars for canning? 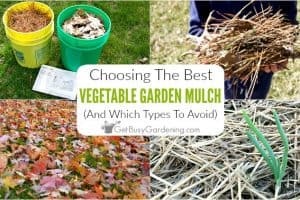 Add your tips in the comments below. I’m concerned about taking the jars out to be filled. Won’t there be water still in the jar? How do I know that they are dry enough to fill? 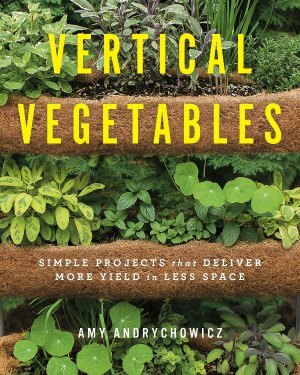 Yes, they will be filled with water when you pull them out of the pot. 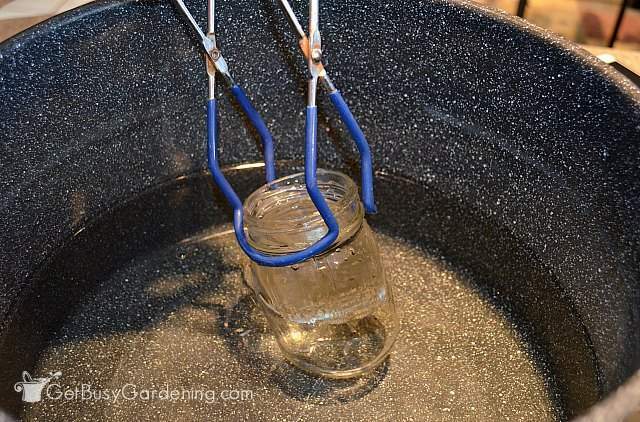 I use my canning jar lifter to carefully tip them as I pull them out of the water to empty them (just pour the water right back into the pot). You want them to be empty, but they don’t need to be dry to fill them. You want to fill them right away so they don’t have time to cool down. Hope that makes sense.